Primarily a tight-head, Tialata came to the attention of the All Black selectors after a strong showing in the 2005 NPC for Wellington. His international debut came against Wales in the first game of the All Blacks' Grand Slam tour in November 2005, after which he became a regular for the Hurricanes in Super 14 competition. He amassed a 46 game selection streak for the side through to the end of the 2007 season. Having represented the All Blacks at the 2007 World Cup, Tialata built his reputation at international level. By the end of 2008, and his second Grand Slam tour, he was a regular starter and carried this form through to the 2009 Tri-Nations. 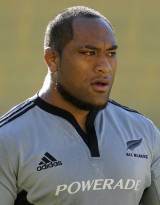 The emergence of the Franks brothers, Owen and Ben, and the resurgence of fringe All Blacks such as Wyatt Crockett led to Tialata dropping from the interantional scene in 2010, although he did help the Barbarians beat South Africa in December that year. In May 2011 he was announced as a new signing for ambitious Top 14 side Bayonne.